Franz Schubert, an early romantic Austrian composer, is best known for his lieder (German art songs for voice and piano) during the nineteenth century. A new profusion of lyric poetry and the evolution of the piano into a highly complex mechanism allowed the gifted Schubert to compose exceptional lyrics. Franz Peter Schubert was born in Vienna, Austria, on January 31, 1797, the fourth son of Franz Theodor Schubert, a schoolmaster, and Elizabeth Vietz, a domestic servant in Vienna. Encouraged to pursue his talents in music, Franz received instruction in the violin from his father, his older brother Ignaz, and Michael Holzer, the organist at the Liechtenthal parish church. In 1808, through a competitive examination, the eleven-year-old Schubert was accepted into the choir of the Imperial Court Chapel as well as the Royal Seminary. Although he was homesick, he was an outstanding student. Besides singing in the choir, he played in the orchestra. He became familiar at this time with the music of Franz Joseph Haydn (1732–1809), Wolfgang Amadeus Mozart (1756–1791), and Ludwig von Beethoven (1770–1827). Schubert was a shy youth, and spent most of his spare time practicing and composing by himself. He left the choir at age fifteen when his voice changed, but continued to study at the seminary. Antonio Salieri, the emperor's music director, heard about Schubert's talents and took him in as a student. In 1814 the genius of Schubert was first made evident in his work Gretchen am Spinnrade, inspired by his reading of Johann Wolfgang von Goethe's (1749–1832) Faust. His first Mass and his first symphony appeared about this time and showed the influence of Haydn. Schubert set five other Goethe songs to music that year. By the end of 1814 Schubert was an assistant at his father's school and had begun to make the acquaintance of numerous poets, lawyers, singers, and actors, who soon would be the principal performers of his works at private concerts in their homes or in those of their wealthier friends. excitement of the Erlkönig (1815), where by means of changing accompaniment figures, sharp dissonance (an arrangement of clashing chords), and effective modulations (the shifting of one musical tone to another) Schubert makes a distinction between the four characters of the ballad—narrator, father, son, and Erlking—and creates one of the masterpieces of romantic music. While still a schoolmaster, Schubert composed Symphonies No. 2 through No. 5. At this time he also wrote many of the delightful dances, waltzes, and Ländler (a type of Austrian waltz for which he was known during his lifetime). By 1817 Schubert was living in the home of his friend Franz von Schober, where he wrote several piano sonatas (instrumental music composed of four contrasting movements). In his father's house there had been no piano. Examination of the sonatas proves Schubert to have been rather daring in his juxtaposition (placing one next to another) of keys, particularly in development sections. In addition to instrumental compositions, Schubert wrote fifty songs in 1817. In July 1817 Schubert was appointed to the household of Count Esterhazy and his family, who spent winters in an estate slightly north of Schönbrunn and summers at Zseliz in Hungary. 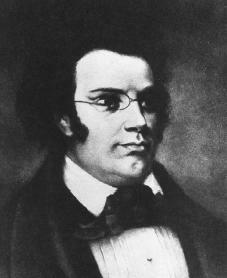 There Schubert composed many of his works for piano duets. Between 1820 and 1823 Schubert achieved his musical maturity. Two of his operettas and several of his songs were performed in public and amateurs and professional quartets sang his part-songs for male voices. Some of his works began to be published and performed in private concerts. In September 1821 Schubert and Schober left Vienna for the country with the intention of writing Alfonso und Estrella, his only grand opera. Shortly after his return to the city, he met Edward Bauernfeld, who introduced him to William Shakespeare's (1564–1616) works. In the fall of 1822, having completed his Mass in A-flat, Schubert began work on the Symphony in B Minor, which became known as the Unfinished. Three movements were sketched; two were completed. It is not known why the work was left incomplete. Schubert's health began to fail, and in May he spent time in the Vienna General Hospital. Rosamunde , a play for which Schubert had written incidental music—only the overture and ballet music are heard today—failed in 1823 and brought to a close his extended efforts to achieve a successful opera. Schubert now turned to chamber music, producing an Octet for woodwinds and strings and his A Minor, D Minor, and G Major Quartets. In 1825 Schubert formed the mainstay of the Schubertiads, evenings at which Schubert's songs were sung. In 1826 and 1827, despite the reappearance of his illness, Schubert wrote four masterpieces, each of which has remained a staple in his repertory (works commonly performed): the String Quartet in G, the Piano Sonata in G, the Piano Trio in B-flat, and the second Piano Trio in E-flat. Schubert was one of the torchbearers at Beethoven's funeral in 1827. Toward the end of that year Schubert completed his two series of piano pieces that he himself entitled Impromptus. In 1828 Schubert composed several first-rate works: the magnificent F-Minor Fantasy for piano duet, the C-Major Symphony, the Eflat Mass, and nine songs to Ludwig Rellstab's poems. On March 26, 1828, Schubert participated in the only full-scale public concert devoted solely to his own works. In musical history Schubert stands with others at the beginning of the romantic movement, anticipating the highly personal approach to composition of later composers but lacking the forcefulness and the creative means to experiment with instrumental music that Beethoven displayed. Many of Schubert's large-scale instrumental pieces were unknown until after the middle of the nineteenth century. Moreover, unlike many other romantic composers, Schubert did not try a literary career. He was never a conductor or virtuoso (extremely gifted and skillful) performer. He did not achieve considerable public recognition during his lifetime. However, there is a lasting quality to Schubert's work that reaches out over the ages which few composers have matched. Clive, Peter. Schubert and His World: A Biographical Dictionary. New York: Oxford University Press, 1997. McKay, Elizabeth Norman. Franz Schubert: A Biography. New York: Oxford University Press, 1996. Newbould, Brian. Schubert: The Music and the Man. Berkeley: University of California Press, 1997. Reed, John. Schubert. 2nd ed. New York: Oxford University Press, 1997. This article is very helpful and it was enjoyable to read unlke most biographies. I really enjoyed how this biography was clear and focused on explaining only the most important facts for the reader. Schlesinger Jr., Arthur Schulz, Charles M.